An unusual form of getting around, primarily found in video games. Hop in one end of the tube, get shuttled through in some manner, and come out the other end. Instead of taking a direct route, the tube may take a complicated snake-like path to the destination. In Kingsman: The Secret Service, a pneumatic-tube subway connects the sub-basement deep below the Kingsman's tailor shop on Saville Row in London with an estate many miles distant which serves as the headquarters and training facility for the Kingsmen. In E. E. "Doc" Smith's Skylark series, the largely-aquatic humanoids of Dasor use systems of pipes filled with rushing water as their mass transit system. Years before Project M the Brawl mod, there was "Project M" the April Fool's joke] in Nintendo Power, about Super Mario Bros.-inspired pipe travel. In Bionicle, there's the chute system of Metru Nui. (Tube technology.) Chop, chop, let's go! The Jazz Jackrabbit series has these, most famously in the Tubelectric stages. The warp pipes in the Super Mario series are iconic. However, in some cases (such as the warp zones) you appear to be teleporting instead of traveling a path. The latter was never clearly shown in the games until Super Mario Bros. 3, particularly in World 7 "Pipe Maze". A Link to The Past has this in the Turtle Rock dungeon. Clyde's Revenge has this starting with the eighth level. It is possible to go through the tubes in both directions. A frequent method of travel in Strider for the NES. In the game Alpha Centauri, the technological advance of Monopole Magnets grants tube travel to your faction. Happens in Kirby's Epic Yarn, where Kirby unravels into a single, long piece of yarn and travels through tight spaces in a few levels. You can control moving forward and backwards, as well as move left or right when the path branches off. Drill Dozer has many threaded tunnels that require drilling one way or the other to enter and navigate. Defeating the boss of Area 5 involved being able to navigate tunnels within a time limit. Very common in the Sonic the Hedgehog games. 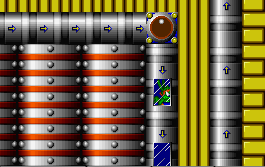 Sonic the Hedgehog 2 has it in the Chemical Plant and Metropolis Zones, Crazy Gadget in the second Sonic Adventure game, Secret Base and Egg Rocket in Sonic Advance, and others. Cave Story has one, though it isn't important to the overall gameplay. It just there to help you get out of Plantation's water reservoir faster (possibly in case you fall in without the jetpack equipped). Earthworm Jim 2 had this in the ISO 9000 level, though it looked painful (the entrance was a grinder). Happens briefly at one point in Portal. Is built up on more in Portal 2. Tube travel is the main way everything in Aperture Science gets into test chambers, it is ridiculously inefficient and expensive, and there are so many props in the facility that no one even cares. Command & Conquer: Generals features the Tunnel Network for the GLA, which involves building separate entrances that are somehow magically connected the instant the Tunnel entrance is completed no matter the distance or location on the map. StarCraft: The Zerg have the Nidus Canals, which act in the same way as the Tunnel Network as mentioned above. Sackbots are transported this way in LittleBigPlanet 2. Cosmos Cosmic Adventure has these, though it's a bit odd since the pipes look too thin for Cosmo to fit. F-Zero X and GX have levels where you are in a tube, and on the outside of a tube. X-COM: Apocalypse "The People Tube network is the mass transit system for the whole city. The anti-gravity pathways suspend the traveler above the floor and safely propels them at speeds of about 25 miles an hour." That's the means by which your newly recruited staff usually arrives to the base. It's also a bunch of fragile tubes on supports, that tend to be the first thing destroyed by stray shots, leaving the whole sectors of Mega-Primus disconnected. This is how vertical connections in bases work in Subnautica -- you click "climb up ladder" or "climb down ladder", and suddenly you're at the other end, no matter how long a climb it is. This is how John Freeman gets into GLaDOS's chamber in Djy1911's adaptation of Half Life: Full Life Consequences. Futurama has the Tube Transport System. Spoofed in "Rocket Squad", a Looney Tunes parody of Dragnet set in space, where the pneunatic tube system provides a bumpy ride for Daffy and Porky, with the latter remarking how people used to use elevators. Some playground and water slides are like this. Pneumatic Tube systems (AKA "the things in bank drive throughs", though some larger people movers have been made). Likely an inspiration for at least some of the above examples. This page was last edited on 16 August 2018, at 20:09.